We had a foot of snow on the day of the craft fair, so business was not brisk, even though the air was. Here are some last projects. 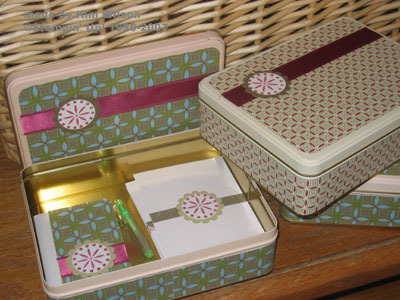 The tins were made with last year’s version of the Wintergreen dp, Satin Ribbon and the Big Pieces stamp set. They contained a set of 8 cards, a pen and a mini composition book. 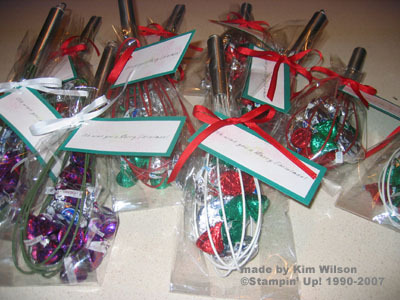 The wisks are filled with chocolates and the stamped tag says :we wisk you a merry Christmas (from the font CD). Beautiful projects. Do you find that people tend to purchase more at a particular price point?